Here in the Twin Cities, we appreciate a good beer. If you have ever had a German beer, you can thank King Ludwig for signing the Reinheitsgebot (German Beer Purity Law) in 1516. You don’t need to be able to pronounce Reinheitsgebot in order to attend the Black Forest Inn’s banquet in its honor. You don’t even need to know what it is. But if you’ve ever enjoyed a German beer, you’ve appreciated its contribution to beer drinking enjoyment for 500 years. The 500th anniversary of the Reinheitsgebot, the German Beer Purity Law, is on April 23. 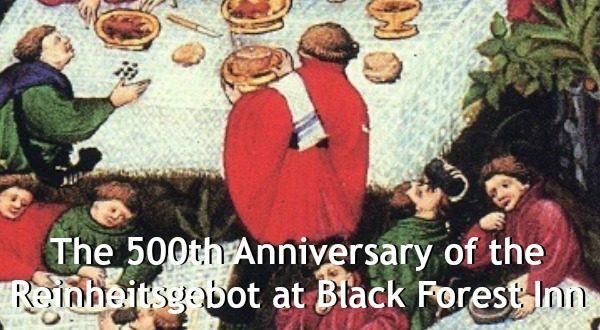 To properly celebrate, the Black Forest Inn​ is having a medieval-inspired German feast with beer. Lots of beer. Prost! Saturday, April 23 at 6:00 p.m.
Join us for a celebration of the 500th Anniversary of the signing of the Reinheitsgebot, the German Beer Purity Law. Since then, German beer has been the standard for true beer, made with only four ingredients: hops, malt, water and yeast. To properly honor the Reinheitsgebot, we are having a medieval-inspired German feast accompanied by great German beer! *You will be provided with a ceramic stein commemorating the 500th anniversary of the Reinheitsgebot to drink beer during the event and then you may take it home with you! End the evening with some schnapps!